I cannot wait for fall. The first warm day to hit D.C. last spring, my attitude immediately turned sour. Summer in D.C. has a lot of great qualities, but many more awful ones. It is insanely humid, with flash thunder storms, and killer mosquitoes that absolutely love to feast on me. I got three mosquito bites on my legs yesterday (despite the fact that I had on mosquito repellent!) and they are currently swelling up as I type. Dangnabit! It's cooler today though and it reminds me that September is just one week away, which means fall is just around the corner. I can't wait. Bring on the sweaters, squash, and soup. I saw this color pallet somewhere and fell in love. It's very fall-y. I've especially gone gaga over mustard yellow. I am on the hunt for anything mustard yellow: sweaters, pillows, shoes, curry, nail polish, book covers, etc. 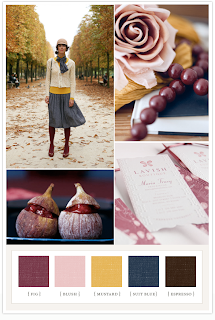 I think it's a lovely color and when paired with grey and maroon, can make for a really tasty combination. Yes, fall rocks. You forgot to mention crunchy leaves, pumpkins and pink ladies.